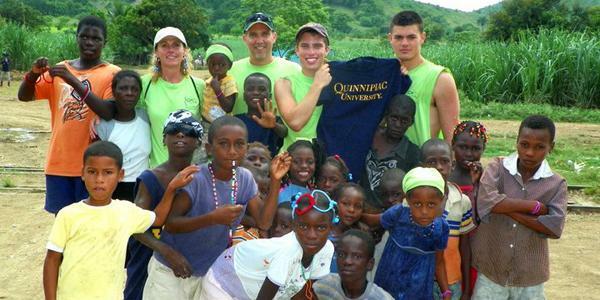 While most college students go to the Dominican Republic for vacation and pleasure, Quinnipiac Adjunct Public Relations Professor John Powers takes students to help parts of the country most Americans never see. For the past 22 years, Powers has led groups of Quinnipiac and Yale student-volunteers to the Dominican Republic to support troubled locations by building hospitals and clinics, as well as bringing clothing. In addition to their physical presence, between now and April, Powers and Quinnipiac Traffic Control Officer Ken Kastenhuber will collect sporting equipment and clothing for Dominican children and adults. Kastenhuber and Powers met in the faculty parking lot and began discussing Powers’ annual trips with students to La Romana in the Dominican Republic. Powers spent time with children who played sports with no shoes or equipment. It would be Kastenhuber’s history as a youth sports coach that would lead to a collaboration between the two. “I coach youth football, basketball and lacrosse in North Haven and I immediately felt for the people [in the Dominican Republic] and wanted to jump in and help,” Kastenhuber said. The Quinnipiac athletics department is contributing by donating sports equipment, Kastenhuber said, giving everything from basketballs and soccer balls to sneakers and cleats. Powers will lead a group of 90 students to La Romana, Dominican Republic in late June, alongside foundations such as the Dominican Republic Mission Team. Zachary Zealor traveled to the DR last summer with Powers, and said the experience was life changing. Over the course of his involvement abroad, Powers has seen significant progress as a result of his trips over the years. “Back in 1990, this ‘hospital’ was just six holes in the ground, and now it is three stories tall and treats over 50,000 patients each year,” Powers said. “Houses are being built for people living in dilapidated shacks, schools have been started, hungry people are being fed and some very poor kids have been able to go to high school and college and are now professionals making a difference. Since 2011, the Dominican Republic has an unemployment rate of 13.3 percent, and in 2004, 42.2 percent of the population lived below the poverty line, according to the CIA website. The group provides medical clinics, works on construction of the Good Samaritan Hospital they helped build in La Romana, builds homes for those living in deplorable conditions and many more charitable projects, John Powers said. “We are working to rebuild every home in this village (50 homes) where families live in shacks built with scraps of metal,” John Powers said. To contribute, bring your donations by the Mount Carmel Campus security office.